New Jersey has amazing choices to select from for your perfect backdrops for your best Nj wedding day photos captured by our team at Starlight Studioz. 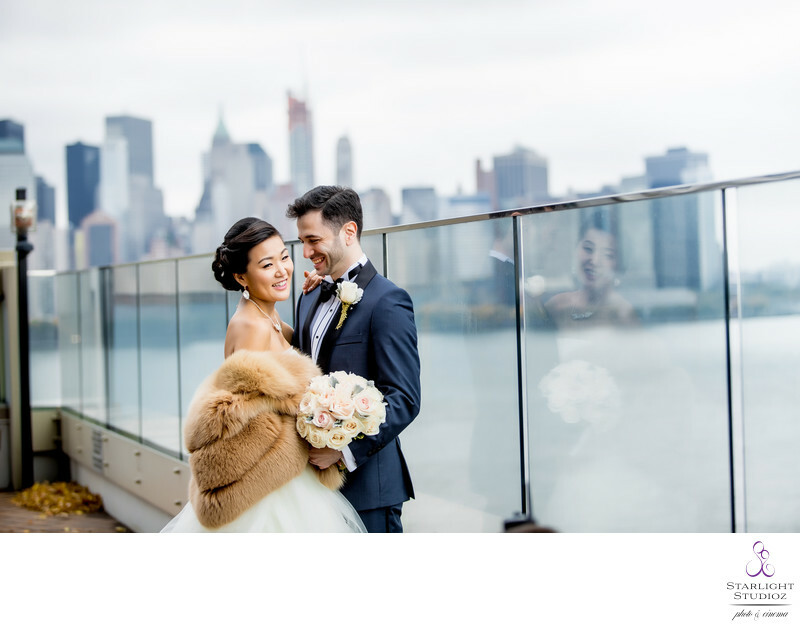 Jersey City is one of the top locations as it boasts gorgeous views of the city which brings us to our couple Vera and Alex. The bride and groom started their New Jersey wedding photo shoot, in Jersey City, NJ at the brides parents apartment building rooftop. This fall wedding at the end of October was magical. You can see in the background of this photograph the stunning manhattan skyline. Love the photos so much I couldn't help print a canvas and metal print from their wedding that hangs in our Brooklyn office. We captured photos of the lovely couple by the Colgate sign in Jersey City overlooking the Hudson River to the city. Once we captured their photo session and then the couple headed to their wedding venue at the Valley Regency for the outdoor wedding ceremony & reception. The beautiful love and happiness they share is wonderful, couldn't help but also design a wedding sample album of the couple to display future brides.